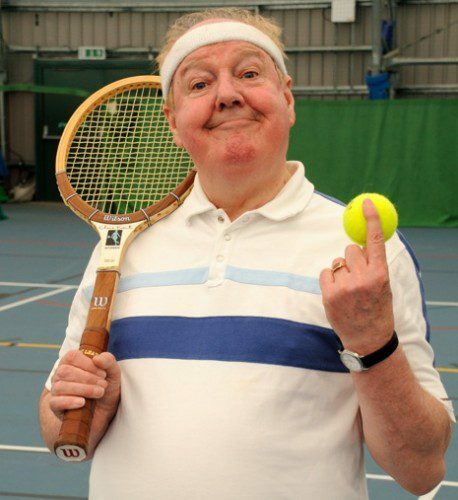 Jimmy Cricket has been trying his hand at tennis – or an unlikely mixture of tennis and cricket! – ahead of an international sports tournament. The Aegon International at Devonshire Park in Eastbourne starts on Monday (18 June) and for many top tennis players is an annual warm-up for Wimbledon which begins the following week. Former world number one Andy Roddick is one of the names appearing at this year’s Aegon International after the 2003 US Open champion was knocked out of the current tournament at Queen’s Club in the second round. 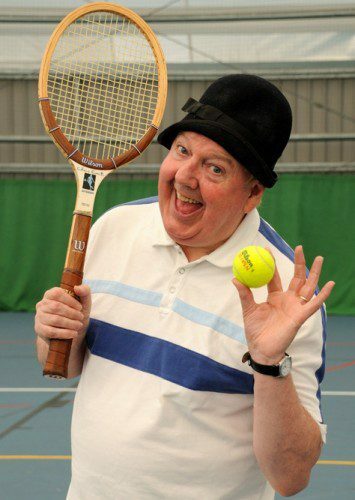 Comedy legend Cricket, who is currently starring in the variety show Sentimental Journey at the Royal Hippodrome Theatre on Seaside Road every Tuesday and Wednesday until 26 September, could not resist a trip to Eastbourne Sports Park to see what happens when Cricket met tennis! The Irish funnyman larked about for the cameras with his trademark wellies (on the wrong feet of course). 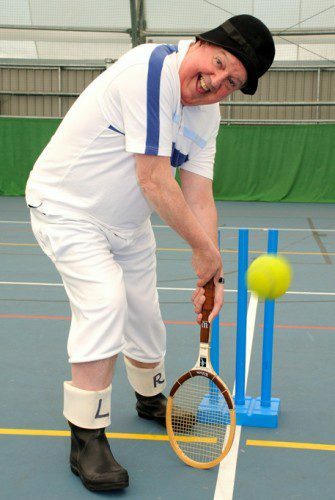 His jovial banter lit up the huge all-weather tennis centre situated at Cross Levels Way, Eastbourne. Sentimental Journey is a traditional, family friendly variety show, which has been playing at the delightful ‘hidden gem’ of a theatre since May. Audiences and critics have been enjoying the show and delighting in Jimmy’s hilarious routines which feature an array of ridiculous props, stories and jokes. And “there’s more” as the cast also includes music from Colin Gold as Billy Fury, Tracey Lea as Connie Francis with comedy from Mike Lee and Barry Moon, plus the Showtime Dancers. Tickets are priced at £17 – to book call the box office on 01323 412000 or go online here. Eastbourne Sports Park is a collaborative project between Eastbourne Borough Council, East Sussex County Council, Sussex Downs College, Park College and Sport England. All photos for this story courtesy of Peter Gurr.